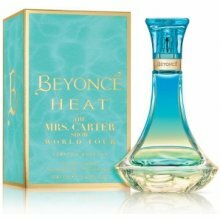 Beyoncé Heat The Mrs. Carter Show World Tour Limited Edition by Beyonce is a Floral Fruity fragrance for women. This is a new fragrance. Beyoncé Heat The Mrs. Carter Show World Tour Limited Edition was launched in 2013. Top notes are pink pepper, mangosteen and acai berry; middle notes are orchid, violet and jasmine; base notes are australian sandalwood, vetiver and madagascar vanilla.